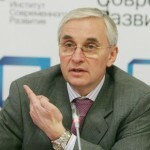 In an article published in Izvestiya on Monday, February 6, INSOR Management Chairman Igor Yurgens remarked that the institution of a vice president might be a welcome improvement to the Russian political system. It would make the political system more stable and could perhaps be offered to Dmitry Medvedev, Yurgens suggested, to ensure follow-up on long-promised reforms of the legislative and judicial systems. “The people who support Medvedev ought to speak up in favor of vice presidency in Russia. Vice presidents here should reorganize the parliament and the judiciary... like in the United States, where this is Joe Biden’s responsibility. I do not think that the premiership under President Vladimir Putin will be all that beneficial to Medvedev’s political career,” Yurgens told the newspaper. “Putin said that the economic and political affairs will develop in a paradigm where stability is king. In such a paradigm, Medvedev slowly becomes obscured, with the big bright personalities that have already been appointed deputy prime ministers, such as Rogozin and Surkov, coming to the forefront. And it is clear the Sechin is staying put in the energy sector,” Yurgens commented.